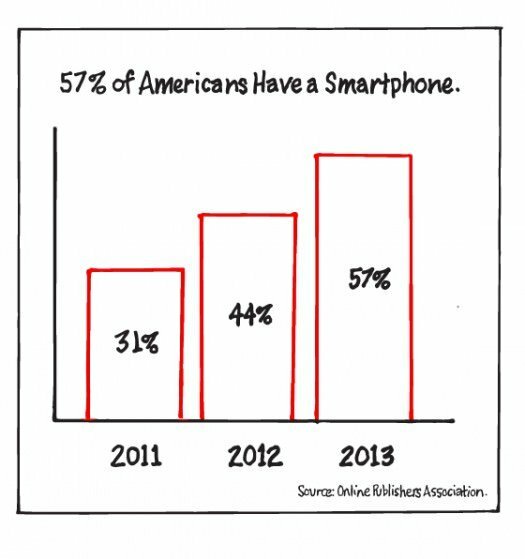 In 2013, smartphone penetration in the United States will reach 57%. This is when we cross the chasm – the majority of adult Americans will have, in their pants, access to most of the world’s knowledge, at all times. When consumers have access to more information, they seek more information. Google documented this in their Zero Moment of Truth research that found that consumers, on average, needed 5.3 sources of information before making a purchase in 2010, but 10.4 sources in 2011. If you don’t fully inform your prospects, they’ll find someone else who fill. Marketers must open the kimono and over-explain everything to potential customers. 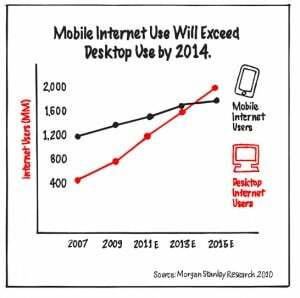 Now that most phones have full Web browsing capabilities, the percentage of mobile traffic to your website and other online assets will increase precipitously, if it hasn’t already. The next time you modify or redesign your website, you must think about the mobile experience first and then determine what other elements you can and should add to the desktop browsing environment, if any. This is of course the opposite of how 99% of all websites are strategized. I’m paraphrasing my friend Tim Hayden from Edelman Digital here, but marketers must realize that mobile is primarily a circumstance. In addition to thinking through mobile-friendly assets as recommended above, understand what and why your customers need to know about you when they are in an environment where mobile is the preferred connection mechanism (out of home, on-the-go). In addition to limitless information, consumers also carry all their friends in their pocket (it’s crowded in there, like a clown car) via their social connections. Your company is literally competing for attention in social media and email against your customers’ and prospects’ closest friends and family members. You win in that hyper-competitive environment not by shouting the loudest, but by being truly and inherently useful, the same way our friends are useful. What information can you create or provide, now and in the future, that’s so valuable that your customers and prospects actually want it? That’s what Youtility (my new book) is all about: creating marketing that’s so useful, people can’t wait to receive it.